Built by Alfonso Torreggiani in 1733, this became the permanent home in Bologna of the followers of St Philip Neri, although it wasn't meant to endure. After Napoleon's suppression of Italy's monasteries, it closed in 1866 and was transformed into a military barracks. In 1905, the Church reclaimed it, and held Masses there until 1944, when it was hit by an Allied bombardment and left half ruined. In 1948 was returned to the Padri Filippini, although rather than being restored to its former glory, it became a warehouse for architectural odds and ends. 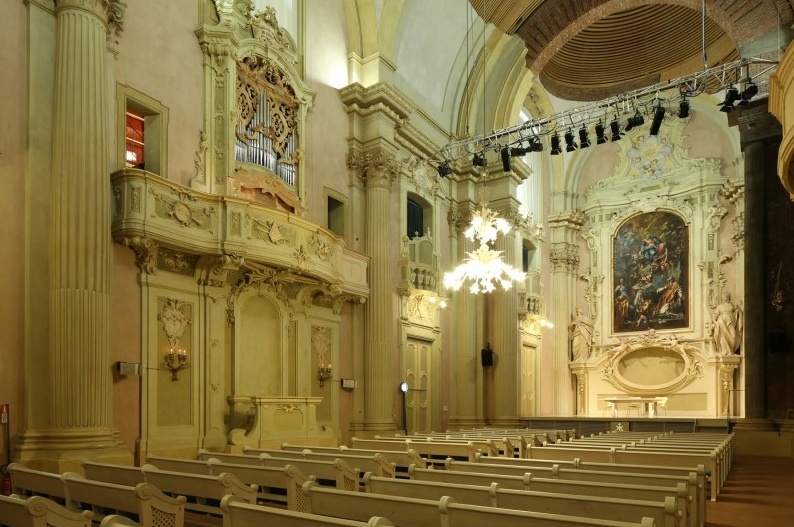 In 1997, the building was purchased by the Fondazione del Monte di Bologna e Ravenna, dedicated to preserving and promoting cultural heritage, and has since been beautifully restored as a venue for concerts, lectures and spectacles; the website has a list of coming events.